Elderberry juice is made from pressing and straining the liquid of small dark elderberries, the fruits of a shrub-like tree. It shouldn't be confused with elderflower cordial, which is a sweet drink made from the flowers of the elderberry bush and not the berries themselves. When combined with a bit of sugar and strained thoroughly, elderberry juice has a sweet, refreshing taste. In addition, many herbalists and health-food enthusiasts drink the juice for its reported health benefits. No benefits of drinking this juice have been scientifically proven, but many studies have uncovered positive effects that are related. Some herbalists find it to be an effective cure for colds, influenza, and sinusitis. The juice may have cancer-prevention properties and could reduce the risk of yeast infections and cardiovascular disease, perhaps due to its high level of antioxidants. Drinking the juice regularly can improve vision. The antioxidants and flavonoids in the juice may help boost immune-system activity and help the body ward off diseases and harmful bacteria. Elderberries are a good natural source of vitamins A, B, and C. They also contain amino acids, the essential building blocks of proteins. The juice is a mild natural diuretic and laxative. Elderberry juice is not as widely available as many other types of berry juice, but a number of companies produce and market it commercially. Biotta sells a certified organic 8.4-ounce bottle of the juice, which is made in Switzerland. Wyldewood Cellars offers a smaller bottle of elderberry juice concentrate, which has no additives. 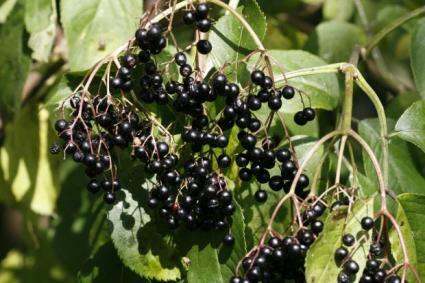 Black elderberry "liquid extract" is manufactured and sold by Dynamic Health. Though elderberries themselves are completely safe, the other parts of the elderberry bush, including the stems, leaves, seeds, and roots, produce active alkaloids and cyanide that can be toxic to humans who ingest it. In addition, some species of elderberry plants produce red berries, which are inedible and toxic. Only dark-blue or black berries are safe to eat.Although most people do not come down with any adverse reactions after drinking elderberry juice, there is at least one report of people requiring hospitalization after suffering severe nausea, vomiting, cramps, and weakness after consuming juice made from wild elderberries. No traces of cyanide were found in the patients' bodies, but medical professionals do believe that the adverse effects were a result of drinking the juice. If you plan to buy or drink the juice, make sure you get your bottle from a reliable supplier who produces it with berries only and can guarantee that there is no risk of cross-contamination with other parts of the plant. You can drink pure elderberry juice as you might drink cranberry juice or other concentrated juices, or you can use the juice sparingly in recipes or blends. Make a smoothie and flavor it with an ounce or two of the juice. Add a small amount of the juice to a vegetable-juice blend to impart a bit of sweetness and tartness. Sip juice frequently as a prevention method or treatment for colds, flu, or sinus irritation. Simmer the juice until it reduces and turns syrupy. You can add a bit of sugar to the simple syrup and use it to flavor hot beverages or fruit desserts.